I will share a tip that I have discovered myself. 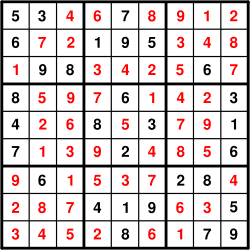 It is based on the fact that the entire Soduko grid is based on permutations. Take a look at the top row section. The pairs permutate through the three main squares, ie. the pairs 3-4, 1-9 and 6-7… and thus 2,5 and 8 are kinda ‘stray’. This kind of pairs appear in each of the three main row sections, and in each of the three main column sections. I think this is a useful tip for getting on with solving a Soduko puzzle… and much easier to understand and appreciate than all the weird ‘X-Wing’, ‘X-Y Wing’-techniques found all over the Net. My tip here is clean and easy ! Make scans row- and columnwise systematically on 1 to 9 and fill in the obvious ones. Systematically. For rows (or columns) missing perhaps 3-4 digits, try to assess if one or more numbers can be placed based on logic, e.g. based on ‘forbidden’ fields due to already appearing numbers in main squares. Do the same for main squares missing 2-4 digits. Bring the pair tip above into play. In the margin of the page, note the definitive pairs next to each main row/column. Often only one pair and a stray can be somewhat easily determined but keep looking. Stuck ? Now the cross-examination of the pairs columnwise vs. rowwise on not yet settled but possible pairs come into play. I think this is the same as the X-Wing technique. Still stuck ? Underline your digits in your solution at this point. Take a try on one of two possible roads. If it was the correct one, you probably end up solving the puzzle. If not, draw a grid yourself and fill in your underlined stuff.. and go on and find the right solution by taking the other road. This kinda works for me…only very difficult puzzles leave me in frustration. But what the heck… that’s what is fun after all.